You were right...that made a great picture. I hope you bag a bird with it! Beautiful gun! Wow ! That’s a beautiful gun ! I missed it if you said the caliber and rate of twist. That is a really nice looking rifle. I've done some really good shooting in the past with a peep sight and A Green Mountain .54 round ball barrel. Don't worry about the mule going blind boy,just load the wagon. Good man. Doing it the hard way with a traditional rifle. There's only a few of us out there who will hunt turkeys with a ML without a scope. But that peep is almost as good as a scope. When I was younger I could shoot some really tight groups using a peep sight on a centerfire. And that wood is really good to look at too. 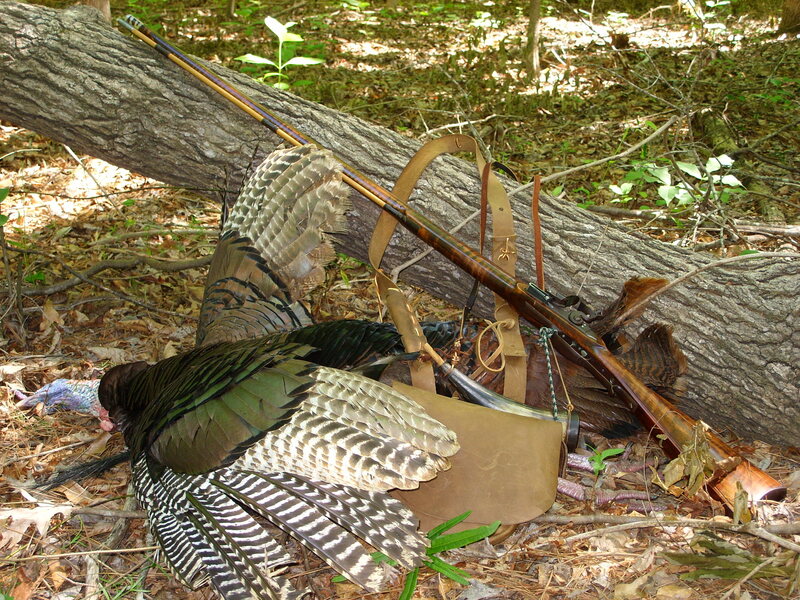 I built this flintlock rifle to be my main turkey gun. The only time it gets left at home is when the woods green out so thick I can't see to make a rifle shot. It has a simple peep, a swamped .40 caliber Rice barrel, and set triggers. I have shot 2 gobblers with a .54, shot through the wing butts it doesn't mess up near the meat you'd think it does. He who is untrue to the past is recreant to the present and faithless to the future. BTW Could you post more pictures of that Hawken? It looks so good I'd like to see the rest of it. Not my cup of tea. It's a beauty though. Hope you smack em' until you're satisfied ! Love it! Beautiful rifle....that’s the whole reason for using black powder....to re-connect with “yesterday”. I can’t get into in-lines and such....I’ll stick with my Hawken’s, Renegade and Seneca. A rifle any of us would be proud to hunt with. Your friend done very well on that one.